Two new patents have surfaced that may provide a look into the future of Mac input devices. The first is for a Magic Mouse that has an integrated touch screen, which could adjust to display things like virtual buttons, keys, menus, text, and video. The patent application shows a diagram of the Magic Mouse displaying a virtual numeric keypad, but when you consider the Magic Mouse is nearly the size of an iPhone or iPod touch, the possibilities are wide open. The second patent shows a Virtual Keyboard that includes a haptic feedback system, which would give a user the perception that the virtual keyboard is a regular keyboard by providing a vibratory response to touch. As PatentlyApple notes, a virtual keyboard has the potential to morph into another input device entirely, such as a game pad or musical keyboard. Apple is clearly interested in further developing touch input across the Mac product line. Previous patents have shown a touch screen MacBook, a convertible touchscreen iMac that runs both iOS and Mac OS X, and a convertible MacBook tablet that may function in a similar manner as the aforementioned iMac. 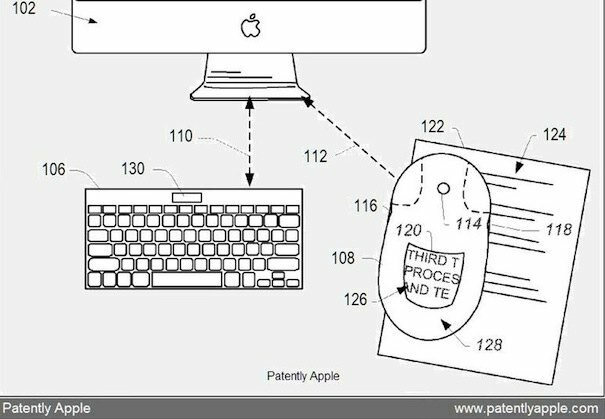 Both of the new patents were discovered by PatentlyApple, you can read more about the Magic Mouse and the Virtual Keyboard over there. If they can make them even HALF as sensitive as a Cintique, I am definitely buying one! Doesn’t it look like the mouse is scanning the document? My 2 year old nephew constantly touches the screen of my iMac attempting to interact with the software. I’m sure when he grows up touchscreen technology will be everywhere. This is my first thought and would be the most likely because else their would be no reason for the paper to be under the mouse. Also it shows the old Apple mouse and looking into the internals of the mouse a scanner would be almost impossible to incorporate. A virtual keyboard would be horrible in any way.